The cover aggregate is stockpiled before the start of the seal coat project. The stockpiles are placed alongside the roadway in the immediate vicinity of the project so that the aggregate does not have to be hauled a long distance when seal coat work begins. The trucks used to transport the aggregate and dump it into the spreader box are usually of the end-dump variety. They are normally either tandem-axle or single axle trucks like the one shown in Figure 7‑38. Figure 7-38. End-Dump, Single-Axle Aggregate Haul Truck. The size of the truck bed is an important factor and is expressed in cubic yards. The single-axle trucks normally carry 6 cubic yards of aggregate. The bed capacity for tandem-axle trucks is usually 12 or 14 cubic yards. The capacity may be increased by adding boards at the top of the sides. All trucks used on a seal coat project should be in reasonably good mechanical condition. They should be free from leaking fuel, crankcase or transmission oil, engine coolant, and hydraulic fluid. Any of these fluids leaking onto a fresh seal coat usually prevent proper bonding of the asphalt and aggregate. All trucks must be legally registered to operate on the public highway and have appropriate safety equipment. All trucks must have a hoist mechanism to enable the bed to be raised in order to dump the load into the receiving hopper of the spreader unit. The truck operator should raise and lower the bed, so the operation of the hoist can be checked. The hoist mechanism should operate properly and be free of hydraulic leaks. The tailgate should be hinged at the top and have the capability of being latched closed at the bottom as shown in Figure 7‑39. This prevents the aggregate from spilling out until the tailgate is unlatched. As the bed is raised, the locking mechanism on the tailgate should be checked. It should lock securely when the bed is in the down position and unlock smoothly as the bed begins to rise. Every truck should be equipped with a hitch that is compatible with the one on the spreader box. This is very important, since the spreader box tows the truck as the load is being emptied. 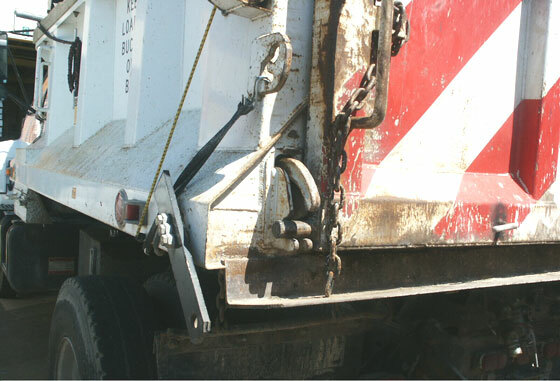 In most cases, this is a bar-type hitch as shown in Figure 7‑40. Figure 7-39. Latch on Tailgate of Haul Truck. Figure 7-40. 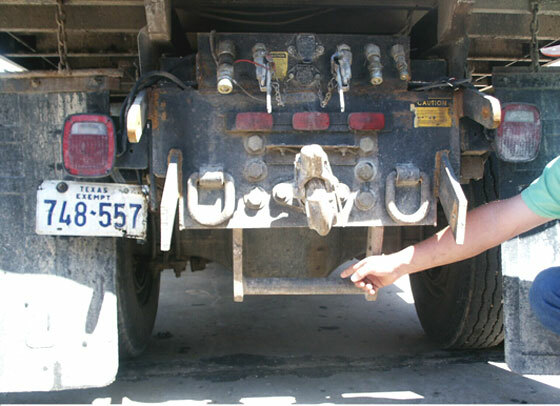 Truck Hitch to Connect to Aggregate Spreader. 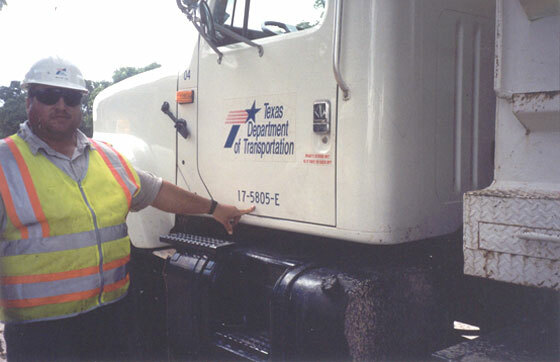 TxDOT requires that each truck used on a seal coat contract have a unique identifying number attached similar to that shown in Figure 7‑41. The number must be securely attached and clearly legible throughout the project. Figure 7-41. Haul Truck with Identification Number Affixed. This number is important for enabling the inspector to identify each truck on the project at a glance. Every truck must be inspected before the project begins, and the bed of each truck must be measured. It would be possible to substitute an unauthorized truck on the job if numbers were not plainly and immediately identifiable. The identification number, the truck bed measurements, and cubic yard capacity should be recorded. The volume of each truck bed must be obtained because aggregate is typically paid by the number of cubic yards placed on the roadway. Each truck is measured, and the number of full loads placed on the roadway is counted to arrive at the pay quantity of aggregate. 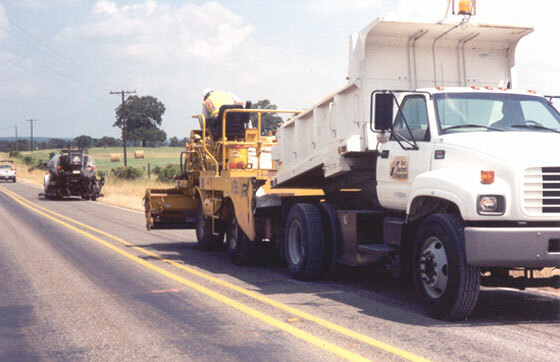 Ideally, all trucks used on the project should have the same capacity to easily compute the volume of aggregate placed on the roadway. There is no particular truck size that is best. The length (L), width (W), and height (H) of the inside of the truck bed should be measured to the nearest 0.05 feet as shown in the example below. These three measurements are multiplied to obtain the volume in cubic feet. This product is then converted to cubic yards by dividing by 27 as shown in the following example. Note: round 12.08 CY to 12 CY. Some trucks have the hydraulic ram recessed into the truck bed, with a housing in the bottom front portion of the bed. If the trucks on the project have this, the volume of the housing must be deducted from the total volume of the truck bed as shown in the example below. In the above example, the capacity of the truck bed, 11.83 CY, is less than an even number of cubic yards, which is not acceptable. It should be an even number of cubic yards or slightly over. To ensure an accurate count of the cubic yards of aggregate for which the contractor is paid, the bed capacity must be expanded. The easiest method to accomplish this is to add sideboards. By adding a standard 2x4 on top of the metal truck bed sides, the capacity can be increased to slightly over 12 CY, which would be acceptable as a 12 cubic yard truck. The addition of boards (2x4s or 2x6s) is common practice. This is acceptable if the trucks do not exceed the gross vehicle weight established by law.